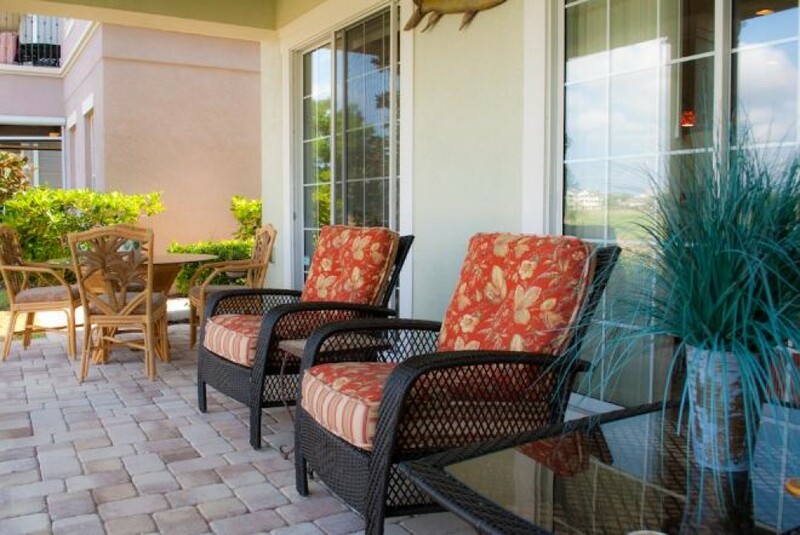 This lovely home located on Corolla Court in Reunion Resort features lots of balconies and patios with breath-taking golf course views and nice breezes. The first floor features ground floor bedroom with comfotable queen size bed and ensuite bath, flat screen tv. The dining room has seating for 6. and nice comfortable furnishings in the living room with large flat screen tv. Kitchen is very open floor plan and has upgraded appliances and granite counter tops. the second floor features bedroom with queen size bed and ensuite bathroom washer dryer utility room another master bedroom with queen bed, seperate seating-living area with flat screen and two chairs, dressor and private balcony with golf course views bathroom with double sink, walk in shower, privacy toilet area and jacuzzi spa tub. 3rd floor features - large master bedroom with king bed, two walk in closets, sitting area, privacy balcony with golf course views, seperate bathroom with double sinks, walk-in shower, and jacuzzi spa tub also another bedroom designed for children and grandchildren very fun themed with two twin beds and nicely decorated adjoining bathroom. Pool is in the court yard with spa and plenty of places to sit and relax and enjoy the Florida sunshine in privacy. This home was decorated and designed with fun and comfort and Florida in mind. You are sure to relax and feel right at home.